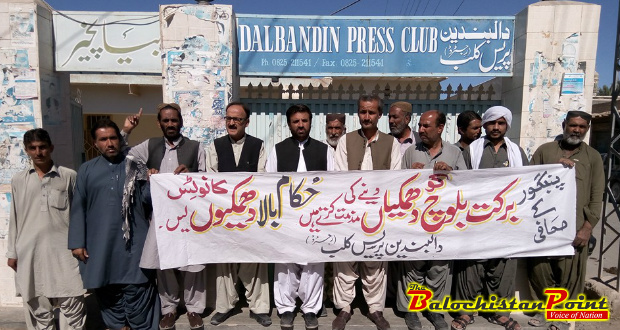 Chagai – Journalists and lawyers in Dalbandin protested against the threats issued to a journalist in Panjgur. A group of journalists and lawyers held a protest demonstration outside Dalbandin Press club on Friday and condemned the threats issued to Barkat Baloch, a journalist based in Panjgur. Reportedly, Journalist Barkat Baloch was threatened by brother of District Chairman of Panjgur. Protest demonstration was attended by Haji Sattar Kashani, President Dalbandin Press Club, Ameenullah Advocate, Shakoor Badini advocate, Nazeer Langove advocate and other journalists. Protestors chanted slogans against threats issued to Barkat Baloch and demanded form higher authorities to take notice of this matter. 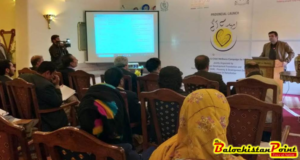 Protestors said that over 40 journalists have been killed in Balochistan since 2008 and government is still not serious about protecting lives of journalist community. 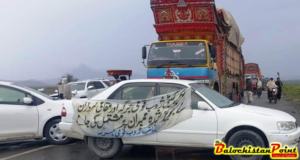 Protestors demanded from journalistic community of Balochistan to show solidarity with Barkat Baloch who has received threats due to his reporting. Earlier, Balochistan Union of Journalist condemned crimes against journalists in a protest in Quetta on Monday.